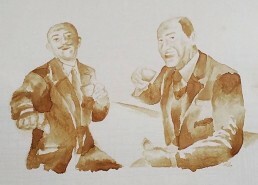 Huge congratulations to Michael Burns (VIC) who won the comp with his ‘old fellas enjoying a short black’ piece. Michael took home the awesome matte black La Marzocco Linea Mini and 6 month’s supply of Locale coffee worth a total of $5000! 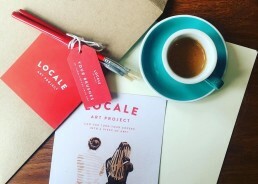 The Locale Art Project was launched to encourage coffee lovers & aspiring artists around Australia to create their own work of art using nothing more than espresso coffee! 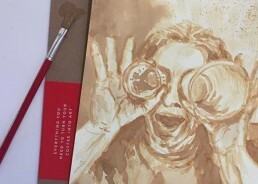 Participating cafes across the country were stocked with kits containing paint brushes, parchment and of course…coffee shots! The entrants each created an original masterpiece, snapped a pic & posted to their socials using the hashtag #localeartproject. Submissions were put before our judging panel with the finalists displayed in a series of exhibitions held in Perth, Sydney & Melbourne. After touring the country, the original artworks were sold in an online charity auction. 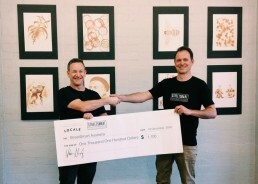 Together we raised $1,100 for CaféSmart, an initiative of StreetSmart, a charity supporting grassroots organisations working in the homelessness sector. A massive THANK YOU to everyone who purchased paintings, the brilliant artists who created them and of course, our awesome café partners who got behind this worthy cause – you guys are all ace!